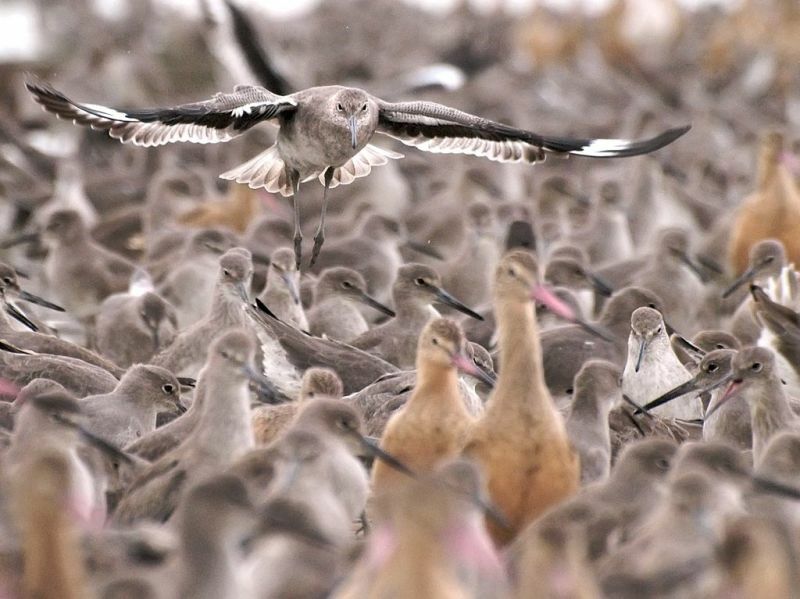 This is one of the riskiest times of life for migratory shorebirds like willets, dunlin, marbled godwits and others. As these birds migrate along the Pacific Flyway, they normally stop to rest and refuel at marshes, lakes and other waterways -- after migrating thousands of miles from the north. Some come from as far as the Arctic circle with migration paths established for thousands of years, particular to their species. 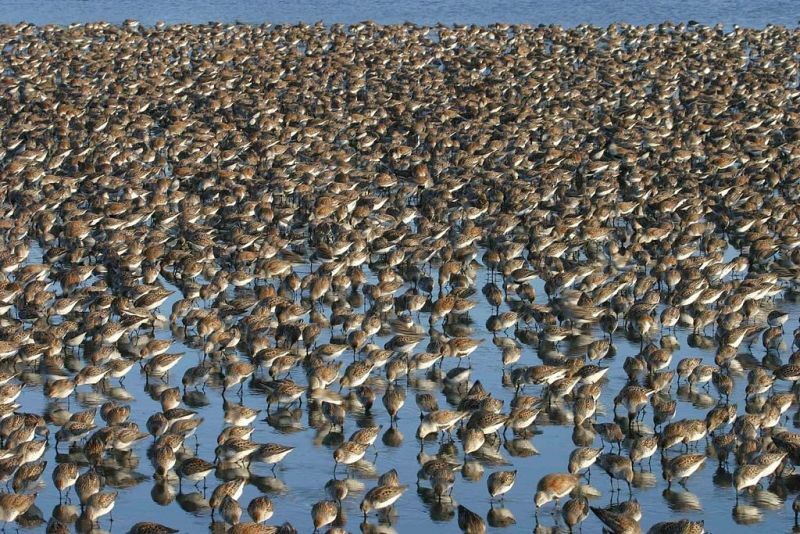 But this year, birds migrating through northern California's coast range and the Central Valley are finding dry areas where they expected lush wetlands. Shorebirds that fly along the coastline seeking refuge have arrived early to East Bay salt marshes; they normally aren't here in large numbers until the end of August or even early September. There's no evidence, though, that birds that normally migrate through California's interior, down the Central Valley, have winged their way over to the Bay, says Melissa Pitkin, Director of Education and Outreach for Point Blue Conservation Science. "Not all birds are able to shift their migration patterns; they don't have the 'plasticity' in their life history strategies to change in that way," Pitkin says. "Some are very strict interior migrants who, in times of drought, will struggle with less water along the migration route." One program underway to assist these avian travelers teaches rice farmers how to manage farms in ways that benefit migratory waterbirds. The Natural Resources Conservation Service, working in partnership with Point Blue Conservation Science, Audubon California, The Nature Conservancy and the California Rice Commission, created and field-tested a set of practices, such as installing islands in flooded fields. The Nature Conservancy has also developed BirdReturns, a program that pays rice farmers to flood their fields after the last harvest, creating "pop-up wetlands" for the birds. The organization piloted the program last year. One of its innovations, Pitkin says, is the bidding process where farmers place bids on how much money they would take to flood fields. These unique partnerships rely on data from the Citizen Science eBird program, a project of the Cornell Lab of Ornithology. The data from eBird pinpoints the location and timing for the flooded fields and helps the partnership make the best use of their funds for these "popup wetlands." Right here in the South Bay, the ongoing conversion of salt-production ponds to tidal wetlands provided new habitat last winter when tens-of-thousands of birds flocked to the newly restored area, part of the Don Edwards National Wildlife Refuge. If you’d like to get involved in monitoring shorebird populations locally, the Migratory Shorebird Project, coordinated by Point Blue Conservation Science, is recruiting volunteers to help with a 10-year population study, with a special focus on dunlin and sandpipers. You can also help shorebirds and all wildlife by, of course, conserving water.